120 - 350 - Off Fifth Avenue, 3 Blocks from Empire State Bldg! 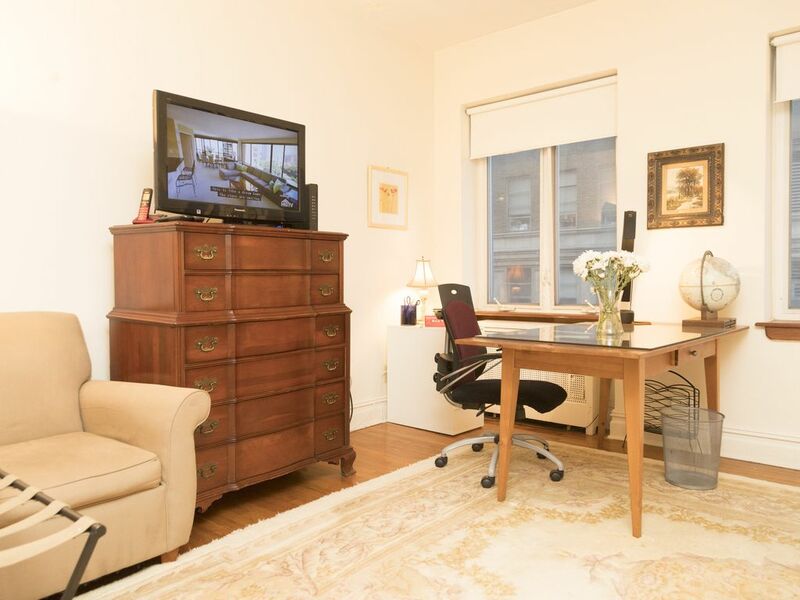 Make this Midtown East alcove studio with separate dining area your private pied-a-terre during your trip to New York. NOTE THAT THIS IS A FOURTH-FLOOR WALKUP. THERE IS NO ELEVATOR. -- wall of windows overlooking 30th Street. This fourth-floor, walk-up apartment is centrally located on East 30th Street between Fifth Avenue and Madison Avenue. It has central heat and air, contains a queen-sized Sealy Posturepedic mattress and box spring (as well as a top-quality, overstuffed chair that turns into a comfy futon bed in less than a minute) and comes with 100% cotton linens, a desk, dresser, flat-screen television and cable TV, free high-speed wireless Internet, free phone service, free toiletries, hair dryer, blackout shades. Walk to subways, Times Square, Penn Station, Grand Central Terminal, the Jacob Javits Center, Greenwich Village, Chelsea. Laundromat is a block away, 24-hour deli at the corner, police precinct house is a block away. No smoking in the apartment and no loud noise that might disturb neighbors. This is a quiet, residential building. If you're looking for a place to party til late in the night, please don't rent from me. Note that construction noise on the block that some guests have cited in their reviews has abated now that the exterior of the building is complete. I am a writer working in New York. Because it is in a great location near many of the city's attractions -- steps off Fifth Avenue between Flatiron, just to the south; Murray Hill, a block to the east; and Midtown, whose southern tip begins four blocks to the north. It's in the center of the Persian rug district, two blocks south of Korea Town and four blocks north of Madison Square Park. A clean, quiet, calm, orderly and safe place of refuge that is within walking distance of many of New York's attractions. Coffee Mate drip coffee and a metal, French-press coffee maker and an Italian screw-top (Moka) espresso maker. Microwave, 4- burner gas stove and oven. Live the way many New Yorkers do -- prepare your own meals, walk to the theater or stay home and read a book or watch TV. What a great spot for a couple or small family! Wonderful Location! My girlfriend and I stayed at this great studio apt in midtown and we couldn't be any happier with our stay! The apt is roomy and comfortable with that NYC "feel" the bed is heaven after a long day of walking around the city! The apt has everything you would need if you choose to eat in which is nice! The stairs by the end of the week got easier to navigate. If you get the chance stay here! Pros: Good location, nice apt., very quiet at night - no street noise. Cons: Those stairs!, Also, you are on your own. When I arrived the front door key did not work. I got the issue resolved, but it was not a great first impression. Second day the cable went out and I had to spend an hour on the phone to get it fixed. The owner was only marginally helpful. I would not stay here again. I don't think the price was that much of a value for the cons. I'm sorry my guest had such a difficult experience, which began before she even got to the apartment -- her key opened the first street-level door, but not the second. As she stood with her luggage in the vestibule between the two doors, she called me for help. Two weeks prior, I had had new keys cut and tested them. They all worked fine--in the first door (I didn't think to try them in the second door, which opens with the same key). I suggested she jiggle the key and try pulling it out a tiny bit before turning it, but neither suggestion helped. I understand that she felt on her own, but that was not the case. I told her I would go to the building to let her in and give her a new key. As we were talking, someone else who lives in the building opened the second door for her. In all, her entry was delayed by no more than a few minutes. I told her where to find a second key to the street-level door, which she had no trouble using. A few minutes later, I sent the maid to the apartment to make sure that she was OK. The maid then took the faulty key to the street-level door and tried it herself. She told me that the key was indeed sticky, but that it worked. I've gotten rid of that key. Early the next morning, my guest called to say that she had been watching TV, but lost the signal when she pressed a button on the remote. She did not know which button she had pressed. I know how frustrating that can be, since I've done it myself, but I am no expert in cable remotes. So I gave her the customer service number for the cable company and suggested she call them. I'm sorry that it took the cable representative an hour to fix the problem. Finally, I'm also sorry that she had a tough time with the stairs, but they should not have been a surprise. My advertisement notes prominently -- and more than once -- that there is no elevator in the building. Prospective guests may want to consider this guest's experience as a cautionary tale. While I think my property is a good value (and many who have reviewed it have agreed), it is not a hotel. Hotels can offer advantages that I cannot. For example, they tend to have people on staff round-the-clock who can help guests carry their luggage and fix balky keys and remotes. Again, I'm sorry she had such a tough time, and am taking steps to make sure that any future guests do not face similar challenges. My husband and I were in town for 6 nights so that I could run the NYCRR Half Marathon and so that I could take my husband to multiple great musicals. Tom’s place is in a good location for sightseeing in that it seemed to be centrally located between Central Park and Battery Park, and it is only 4 blocks from the subway. The place is clean and pleasant. The bed is very comfortable. The kitchen is small, but fairly well-appointed. The bathroom has an old-fashioned skylight that provides extra light. The entryway rug and the kitchen chairs are pretty worn, but everything else was in good shape. I appreciated all the information Tom provided prior to our arrival. It was very helpful. We did not actually meet Tom. The check-in and check-out were simple. If you have any mobility issues, this would not be a good place for you, as Tom hints at. This is because it is a fourth story apartment with no elevator. And that means hauling your luggage up all those stairs , too. We really enjoyed using Tom’s place as a home base during our stay in Manhattan! Thanks to my guest for her review. Guests are greeted by a rug outside the door and a matching rug inside. Both are hand-knotted Persian rugs from the 1920s, and both are clean, but well-worn, as she notes. To some people (myself included), they still have charm and value, but I certainly understand that some people prefer things to look new. I feel the same about the chairs, which are in the alcove off the kitchen. They are made by Yale R. Burge, who was a presence in NY furnishings for 60 years, and are very comfortable. Though they are clean, they are no longer new. Finally, potential guests would do well to heed my guest's reference to the apartment's location, which I have tried to highlight in my advertisement: it is a fourth-floor walkup, and may not be appropriate for people who have difficulty climbing stairs while carrying suitcases. The studio was absolutely perfect for my 2 week stay. There was everything I needed in the kitchen, a comfy bed, clean bathroom and enough room to store all of my belongings during my stay. My only note would be that the landline kept ringing with spam calls so I had to unplug the phone. Check in and check out went flawlessly. I would definitely stay here again! This apartment was perfect for my 3-week work trip in NYC. Overall, the studio was very neat and clean. The bed was very comfortable, and the bathroom was spotless. some of the furniture was a little old, but it didn't bother me. Many thanks to Tom for a wonderful stay! Thanks to Helen for her review. I enjoy living with furniture that has a history, especially pieces that have been in the family -- the chest of drawers was my parents' first acquisition, from Marshall Fields in the early 1950s; the bedside tables are vintage. So too are the hand-knotted Persian rugs and the mid-century Italian desk lamp. Where it matters, I get new stuff: the chair that turns into a twin-sized bed was new in 2018 and the queen-sized bed is recent. But prospective guests looking for the kinds of furniture typically found in hotel rooms might want to search elsewhere. Walk to the lights of Times Square, the clubs of Greenwich Village, the restaurants of the Flatiron District, the galleries of Chelsea. Rates up to $300 per night in high-demand months. New travelers who have no history of having booked with vrbo will need to send a copy of their government-issued photo i.d.